The skin plays a vital role in ridding the body of toxins and impurities. The body has five major routes of elimination: colon, kidneys, liver, lungs, and the skin. Your skin is the largest organ of elimination covering your whole body. Up to a third of all body impurities are excreted through the skin, which is sometimes referred to as the “third kidney”. Did you know 15% of body elimination occurs through the skin. More than 2 lb of waste products is released through your skin daily. Dry skin brushing is one of the best techniques to open up the pores of the skin and to stimulate and detoxify the lymphatic system. 3) Cleanses the lymphatic system. Your lymphatic system in your body is responsible for eliminating cellular waste products, if its congested it leads to inflammation and disease. 5) Strengthens your immune system. Choose a brush with natural fibers. Use long upward strokes starting from feet up to legs, from hands to shoulders, upward on the torse and always towards your heart. Avoid back and forth, scrubbing and circular motions. On your stomach, direct the brush counterclockwise. 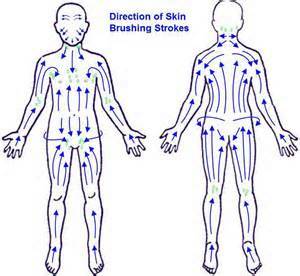 Don’t brush too hard, you want to stimulate your skin not irritate it. Shower after dry skin brushing for extra cleaning and stimulation of the circulation. Once a day is best, if you are unable to aim for 3 to 4 times a week. Your skin should be dry, and do not get the brush wet. The facial skin of most people is too sensitive for brushing; use a Loofah or a special facial brush.